March 15, 2019 Multimedia Essay 1"Food of the Gods", Aztec, Chocolate Drinks, chocolate recipes, Mayan, xocolatlJulia M.
Chocolate has been a major part of Mesoamerican, as well as European history. It has a tumultuous past and is guaranteed to have an interesting future. Chocolate has a place in our lives that we rarely think about, as it had a very important place historically in peoples lives. The preparation of chocolate and its recipes have changed over the years, as I will show later in this post. How we consume and enjoy chocolate is vastly different from how our ancestors and others enjoyed the delicious treat. This domestication and spread of cacao influenced the way we see chocolate today. The Mesoamerican cultures that processed cacao spread that knowledge to Europe, and in return to America. Historically the hot chocolate drink from Mesoamerica was a bitter beverage, not the sweet one we enjoy today. Mayans typically used the chocolate beverage for celebrations and currency, but it was common to be used and drank by all classes of people. They generally drank it with honey or other natural sweeteners, chili peppers, and they frothed the drink (“History of Chocolate”, 2017). In a large saucepan over medium-high heat, add the cinnamon sticks to boiling water. Cook until liquid is reduced to 2 ½ cups. Remove cinnamon sticks; add the vanilla bean and lower the heat a bit, wait until bubbles appear around the edge to reduce heat to low and drop the chocolate pieces and wild pure honey, mix well and whisk occasionally until chocolate is melted. Turn off heat, remove vanilla bean. Whisk vigorously to create a light foam effect, sprinkle the dried chili pepper and serve. Aztecs placed a spiritual connection on cacao and used it as currency as well. The difference was that cacao was reserved primarily for the elite and upper-class. They also liked a bit of spice to their drink (“History of Chocolate”, 2017). Strain it to remove the chile and the seeds, then put the water back in the pot. Add in the other 2 cups of water, put it on medium heat, and bring it to a boil again. As it’s heating up, whisk in the vanilla extract. The vanilla mixed into the pepper water smells really good! I was surprised, I didn’t think it would be very appetizing. Instead of cocoa powder, the most likely ingredient of the time was cacao liquor made from the cacao nibs. The Lacandon Maya of present times still hold true to many ancient Mayan values. They have a drink they prepare called the Lacandon Sacred Chocolate Drink, made very similarly to the way it was made so long ago. They roast the cacao beans, grind them to a foamy liquid, add water and strain, and then pour into the “god pots” (Coe, 2013). Europeans have changed the recipe to closer to what we know as hot chocolate today, with cane sugar and cinnamon as common ingredients. “In 1829 Dutch chemist Coenraad Johannes van Houten discovered a way to treat cacao beans with alkaline salts to make a powdered chocolate that was easier to mix with water” (“History of Chocolate”, 2017). This is what helped with the mass production and consumption of chocolate throughout the classes. In the 19th century milk was added to the hot chocolate beverage, and in 1847 they started making the chocolate bar for easier consumption of the treat. It included cocoa butter, chocolate liquor, dried milk and was aerated to give it a sweeter, milkier and smoother taste. The changes of the chocolate beverage are obvious since ancient Aztec and Mayan times, but the similarities in the way we enjoy this drink are still shared today. Coe, S. (2013). The true history of chocolate (3rd ed.). London: Thames & Hudson. Sean (2013, March 9). Recipe – Xocolatl, the Original Hot Chocolate [Web log post]. Retrieved from http://meltingmug.blogspot.com/2013/03/recipe-xocolatl-original-hot-chocolate.html. In 2017, consumers in the United States spent over $22 billion on chocolate and ate an average of 12 pounds of chocolate per person. That chocolate is consumed in many forms: mass-market Hershey’s Kisses, melted chocolate covering a strawberry, chocolate powder warmed up with milk to be drunk, or an artisanal cacao bar, just to name a few. Chocolate has become so desirable and pervasive in our society that Kay Jewelers even has a collection of chocolate diamond rings. In understanding the history of chocolate, it is important to consider early Mesoamerican civilizations such as the Aztecs and Mayans. In the interest of brevity, I will focus exclusively on the Mayan civilization below. My hope is that by examining a traditional Mayan chocolate recipe, and the societal context of chocolate in classical Mayan society, one will better understand both the evolution of chocolate and also Mayan society itself. At the risk of sounding dramatic, chocolate can be an incredibly powerful way of comprehending history. I begin with a map of the general location of the Mayan civilization (below). I have chosen to include this map for two reasons. The first is that in understanding Mayan cacao, it is necessary to think about environmental factors that dictate nuances such as the characteristics of the Mayan cacao trees and pods. For instance, cacao can only be grown in certain ranges of latitude, but even within that range, temperature and climate differences dictate the nature of the cacao pods in a given location (Coe and Coe, 2007). 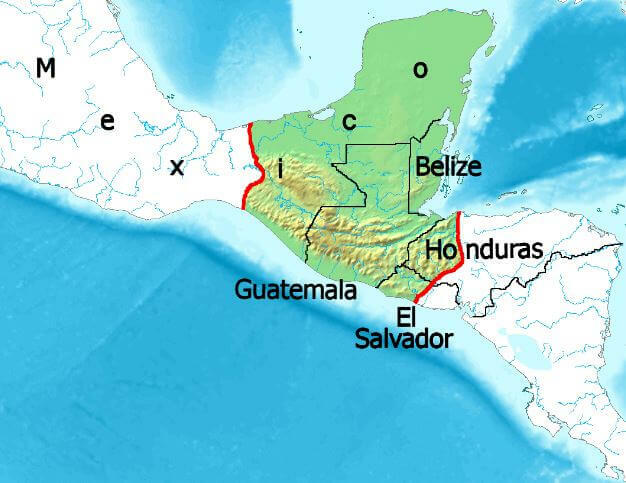 But the map is also worth keeping in mind when considering the spatial relation of cacao to other civilizations. From its origin in the Amazon Basin, cacao spread to Mesoamerican civilizations, and gradually to continents far and wide through institutions such as colonialization. In understanding how civilizations engaged with cacao, it is useful to keep a mental image of a map so as to understand how other cultures then created their own cacao recipes as it moved geographically around the world. Although the so-called classical Mayan era occurred over a millennium ago in the years of 250AD through 800AD, historians have nonetheless been able to piece together aspects of the Mayan civilization through various means: artifacts, linguistics, and written documents, to name a few. Among these methods have been the work of epigraphers such as Yuri Knorosov which has allowed for historians to be able to read texts from the era such as the Dresden Codex (Coe and Coe, 2007). Being able to read books such as the Dresden Codex have in turn shed great insight into how the Mayan civilization engaged with cacao. From the Dresden Codex, for example, historians have been able to conclude that cacao had a place in ritualistic spheres of the Mayan civilization, with descriptions of the gods engaging with cacao (Coe and Coe, 2007). From the Madrid Codex, historians have learned of a powerful connection between human blood and chocolate in Mayan civilization (Coe and Coe, 2007). And from chemical analysis of residue on artifacts, researchers have been able to learn about the vessels through which cacao was enjoyed. While cacao thus held several ‘uses’ of sorts, whether for rituals or consumption, a common misconception is that cacao in Mayan civilization was solely enjoyed in pure form as a drink. Instead, as Coe describes, “pre-Conquest chocolate was not a single concoction to be drunk; it was a vast and complex array of drinks, gruels, porridges, powders, and probably solid substances, to all of which could be added a wide variety of flavorings” (Coe and Coe, 2007, p48). This serves as a nice segue into thinking about a Mayan recipe for cacao. To modern-day Americans, a foodstuff recipe typically consists of a list of ingredients described in precise quantities and orders that result in an end-product ready for consumption. However, the use of the word recipe for the Mayans is much broader (Hull, 2010). From a Mayan recipe for chocolate, we can gather information such as the contexts in which cacao was consumed, the methods of preparation, and characteristics of a society-at-large. Consider the chocolate recipe of sorts that was deciphered by David Stuart and others. In scenes depicted on vases, we can see the process by which Mayans frothed the chocolate beverage. The very act of frothing the beverage shows us a specific, integral feature of the Mayan chocolate. We concurrently see writings that mention flavorings that were added, such as chilli (Coe and Coe, 2007). The types of ingredients added to cacao help us to imagine flavor profiles of the Mayan diet, but also to then compare to later iterations of chocolate found in countries such as England with high levels of added sugar (Mintz, 1986). Finally, vocabulary related to chocolate are an integral part of the recipe. For instance, the term ‘tac haa’ related to fathers’ of a future married couple meeting and discussing the prospect of a wedding over chocolate (Coe and Coe, 2007). A vital component of the Mayan recipe was thus the social aspect of consumption of chocolate. The image included below summarizes some of the above components of the recipe. For instance, the depicted drinking cup would be placed on the ground and have chocolate poured into it from an above height for the purposes of frothing. It also has elaborate depictions on the outside of the cup which are one of the many ways that historians and researchers have been able to piece together the very ‘recipes’ of the ancient Maya. The drinking cup of a classic Maya noble. A great deal can be learned from what may appear above to be a simple recipe. For instance, we can think about how different recipes reflect the broader nature of a civilization. The Mayan recipe seems to focus on cacao as a social experience rather than a commodity. Sidney Mintz’s observations on how sedentary civilizations over time demand more complex carbohydrates in their diets then allows us to understand how recipes evolved to include more sugar and other such ingredients (Mintz, 1986). While the classical Mayan civilization may have fallen more than a millennium ago, the idea of Mayan chocolate has been both idealized and profit-ized; it has become synonymous with chocolate from a past era, eliciting feelings of more natural and wholesome cacao. The included National Geographic video (below) for instance, profiles a chocolatier in Guatemala who is claimed in the video to employ a present-day version of Mayan chocolate making. While the authenticity may be disputed, the genuine interest in understanding distant cultures and societies persists nonetheless. Ultimately, learning about the Mayan recipe has also made me want to be more cognizant of the deliberate choices that are made in the preparation of foodstuff. For instance, it is not only the ingredients that are selected that matter, but also the exacting methods (such as frothing of chocolate for the Mayans) that go into the final presentation. Coe, S. (2007). The true history of chocolate (Revised [and updated ed.]. ed.). New York: Thames and Hudson. Hull, K., Staller, J., & Carrasco, M. (2010). An Epigraphic Analysis of Classic-Period Maya Foodstuffs. In Pre-Columbian Foodways: Interdisciplinary Approaches to Food, Culture, and Markets in Ancient Mesoamerica (pp. 235-256). New York, NY: Springer New York. In today’s society, chocolate is a well known commodity that many people associate with sweetness and romance. A key ingredient in the making of chocolate is cacao. When people think about chocolate, they think of a sweet treat with European origins from places such as Switzerland. However, many people are often unaware that cacao was believed to be discovered in early Mesoamerican civilizations. These civilizations also had quite a different view of cacao and chocolate than the modern view. They viewed these items as luxury goods given to them by the gods and used them for more than simply eating. Cacao and chocolate were used in religious rituals, marriage rituals, and even used to cure illness. The Mayans viewed chocolate so fondly that they would have a yearly festival to honor the cacao god, Ek Chuah. Cacao can be traced all the way back to the Mesoamerican civilizations. According to Magnus Pharao Hansen, cacao was seen as luxury crop during this time period and it provided theobromine for the nervous system after a labor process of cultivation and processing. This evidence allows us to understand that Mesoamerica was becoming a civilization, moving past the stages of just necessities and creating class division and hierarchy. 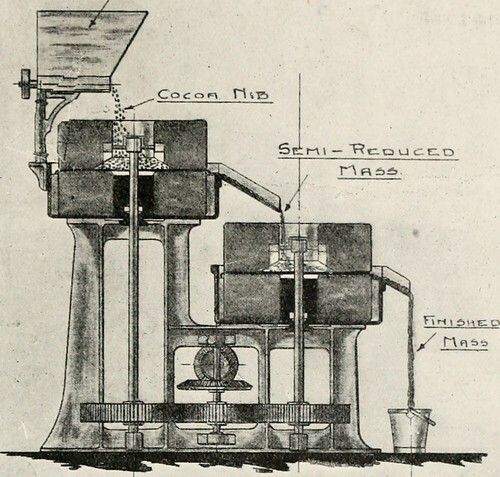 The image to the right shows vessels with residue of theobromine, which is an ingredient in cacao. This shows us that chocolate was becoming a big attraction in civilizations such as the Olmecs. Other civilizations such as Mayans and Aztecs have records that show a strong presence of cacao and chocolate.Documents such as the Dresden Codex, Madrid Codex, and ParisCodex (shown on the right) were in hieroglyphics and have cacao featured throughout, often being consumed by gods in ritual activities. Evidently, cacao was viewed by the Mesoam erican people as more than just a food item, but rather a sacred item given to them by the gods. According to historian Marcy Norton, cacao was viewed in a religious setting as essential to one’s physical, social, and spiritual well- being. During this time as well, many marriage customs involved the presence of cacao. The Mayan marriage rituals had the husband serve chocolate to the father of the girl he wanted to marry and discuss the marriage. Cacao was also used in customs involved death. The rites of death referred to cacao that was dyed red and helped ease the soul’s journey to the underworld. Cacao was used in beverages, as well, during the time of the Mayans. Chocolate beverages were viewed as sacred drinks with the foam being the most important part of the beverage. The beverages were able to boost energy for people due to the caffeine in the chocolate. Usually, it was men of royalty and elite status who consumed chocolate through beverages, while women and children were not allowed to drink the cacao. This is because they viewed it as an intoxicating food. Eventually, cacao and chocolate were being used for medicinal purposes. In the Mayan civilization, cacao was used for digestion and as an anti- inflammatory. In the Aztec civilization, cacao was used to cure infections and illnesses. As Teresa L. Dillinger states, “Childhood diarrhea was treated with a prescription that used five cacao beans. These were ground and blended with the root of tlayapoloni xiuitl (unknown plant) and then drunk. To relieve fever and faintness the prescription called for 8–10 cacao beans to be ground with dried maize kernels and blended with tlacoxochitl.” (Dillinger et al, 2060S) While the uses for chocolate expanded far beyond social use and pleasure, cacao still had an effect on the social landscape of the Mesoamerican civilizations. The Mayans had words such as “chokola’j”, which is translated to “to drink chocolate together”. Cacao had quite a special effect on people and played an important role in society and still does to this day. Clearly, there were many customs and beliefs that the Pre Columbian civilizations had involving chocolate and cacao. The influence chocolate was able to have on these civilizations was immense and impacted their everyday lives. Many aspects of life were changed socially, religiously, and physically. Cacao and chocolate were able to change social interactions and physical treatments of people. People in the Mesoamerican civilizations used chocolate during many marriage, death, and religious rituals. As shown in lecture, foods and beverages such as the one shown on the right, still use the influence of earl y civilizations in order to sell products. The description of this beverage states, “Recommended served warm (106°), this delicious and relaxing beverage was blended to revive the delicacies and keen insights of the ancient Aztec tribes of Central America. Passed from generation to generation, our take on this blessed drink brings you the sensational benefits of anti-oxidant rich cacao and the powerful digestion aid blend of spices to create a tasty healthful experience.” With this description, we can clearly see how the Mayans and Aztecs views on chocolate still influence the modern global chocolate market. Due to the significance of cacao in the Mesoamerican society, chocolate has played a major role in the lives of many people and continues to have a major influence all over the world. Hansen, Magnus Pharao. “Cacao: How a Single Word Holds the Key to Understanding the Mesoamerican Past.” Nawatl Scholar, 1 Jan. 1970, nahuatlstudies.blogspot.com/2015/01/cacao-how-contested-history-of-single.html?spref=tw. Dillinger, Teresa L., et al. “Food of the Gods: Cure for Humanity? A Cultural History of the Medicinal and Ritual Use of Chocolate.” The Journal of Nutrition, vol. 130, no. 8, 2000, doi:10.1093/jn/130.8.2057s. St Jean, Julie. “Medicinal and Ritualistic Uses for Chocolate in Mesoamerica.” Medicinal and Ritualistic Uses For Chocolate in Mesoamercia, 9 Feb. 2018, http://www.heritagedaily.com/2018/02/medicinal-and-ritualistic-uses-for-chocolate-in-mesoamerica-2/98809. Chocolate drinks created from cacao beans date back to the Mesoamericans many centuries ago. In fact, researchers have identified an instance where cacao residue was found on a pottery shard at the archeological site of the Paso de la Amada village occupied by the Mokaya people dating to 1900 to 1500 BC (Presilla 10). Serving vessels used for the precious chocolate elixir created from cacao have varied over time. As the various ingredients for labor intensive chocolate beverages have evolved, so have the vessels that were blessed with the liquid. The early chocolate vessels of the Mesoamerican culture were crafted of ceramics and adorned with colorful designs and hieroglyphics. Specific hieroglyphics offered a hint of Mayan life depicting images that represented parts of their culture. Through scientific analysis, chemist W. Jeffrey Hurst of the Hershey Company determined that both theobromine and caffeine were detected in a jar discovered in a Rio Azul tomb in Guatemala, evidence that cacao had been contained in the vessel (Presilla 9). Cacao is the only Mesoamerican plant that contains both theobromine and caffeine (Coe and Coe 36). In the image below, the hieroglyphic for cacao is labeled on the exterior of the jar, another telltale sign that it contained chocolate at one time (Martin). The clever locking lid on the burial object was an industrious way to keep the sacred chocolate beverage safe and secure. Not only was the vessel sturdy and functional, it also boasts a lovely shape where the lid can be likened to a halo or crown, perhaps worthy of an important person or ruler buried in the tomb. Chocolate jar with locked-lid found in a Rio Azul tomb, dated to ca. 500 A.D.
Fast forward to 1125 AD and the shape of the vessels appeared to have changed. As pictured in the image below, the jars were taller and cylindrical in nature. Black and white jars attributed to that era found in the New Mexican Pueblo Bonito offer evidence of the influence of the Mesoamericans and their trade between the Toltec merchants (Coe and Coe 55). Archeologist Patricia Crown of the University of New Mexico sought confirmation from W. Jeffrey Hurst that sherds from the cylindrical jars from New Mexican Pueblo Bonito trash mound contained elements of cacao (Coe and Coe 55). Hurst confirmed that the sherds (dating between 1000 and 1125 AD) tested positive for theobromine, sufficient confirmation that the Anasazi elite, ancestors of the Pueblo Indians drank chocolate from these vessels (Coe and Coe 55). Cylindrical jar from Pueblo Bonito in Chaco Canyon. As the Spanish invaded Mesoamerica, their influence on the native culture was undeniable and the ritual of chocolate drinking was no exception. In the pre-Conquest days, Mesoamericans raised foam on a chocolate beverage by the simple task of pouring the chocolate beverage from one vessel to another (Coe and Coe 85). In the early 16th century the molinillo, a wooden stick, was used to twirl the liquid to form a foam on the top, a method still used today in some preparations in Mexico and Latin America. However, in the post-Conquest era, vessels that held chocolate beverages changed and spanned a broad range of designs that were both functional and fashionable. Chocolate was introduced to the United Kingdom during the third quarter of the 17th century (Mintz 108). At that time, craftsman designed chocolate pots that were appropriate for both the liquid and the elite drinkers. In addition to ceramic or porcelain, chocolate pots evolved to include pewter, silver and even gold. The image above represents a pot with an adjustable finial that can be removed to allow the insertion of a stirring rod, the British version of a molinillo. This shiny design is representative of a delicate serving pot that nods to the refined practice of serving chocolate to the British elite. 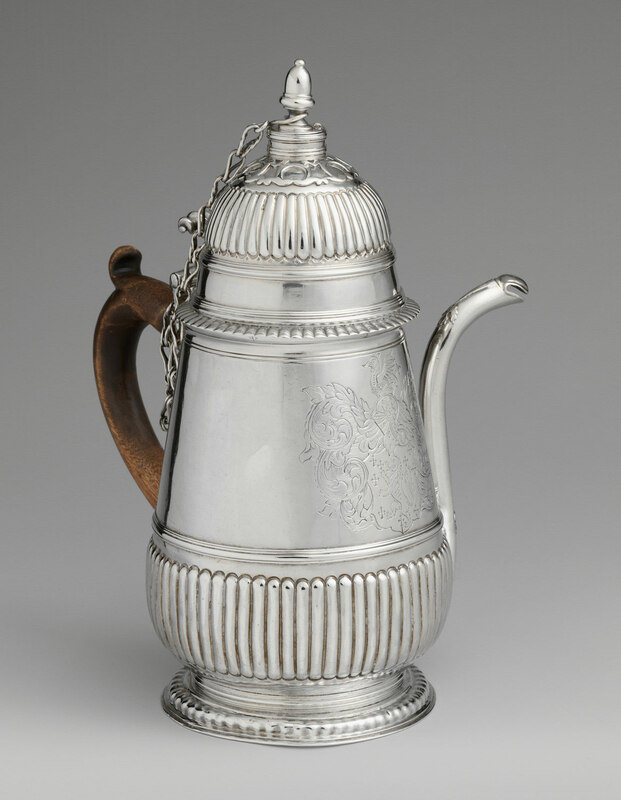 In contrast to the British pot, the image below represents a design created by Edward Winslow, an 18th century American silversmith from Boston, Massachusetts. Unlike the delicate three legged British pot, Winslow’s handsome pot is constructed with a solid base, perhaps indicative of the sturdiness required of early colonists in the new world. If we compare the image of the Barra ceramics in the first image and the last photo of the Winslow chocolate pot, it is hard to believe they were used for the same purpose. The striking difference of the rich warm colors of the rounded ceramic vessels versus the hard cold metal of the 18th century pots are quite opposite and distinct. Just as the chocolate vessels have evolved over time so has the desire or lack thereof for chocolate beverages. Regardless of the type of chocolate pot, the prominence of drinking chocolate in North America and Europe began to wane at the beginning of the 20th century when solid chocolate first appeared. Chocolate aficionados seem to prefer the quick fix of a chocolate bar that can satiate chocolate desire without spending time on the ritual and lengthy preparation of a chocolate beverage and need for chocolate pots. Coe, Sophie D., and Michael D. Coe. The true history of chocolate. London: Thames & Hudson, 2013. Print. Mintz, Sidney W. Sweetness and power : the place of sugar in modern history. New York: Penguin Books, 1986. Print. Mcgovern, Pat. “RioAzul Chocolate-Pot.” Flickr. Yahoo!, 17 Nov. 2009. Web. 10 Mar. 2017. <https://www.flickr.com/photos/patmcgovern/4113214840/in/photolist-7gtitf&gt;. Parry, Wynne. “Sweet Trading: Chocolate May Have Linked Prehistoric Civilizations.” LiveScience. Purch, 01 Apr. 2011. Web. 10 Mar. 2017. <http://www.livescience.com/13533-prehistoric-chocolate-trade-cacao-chaco-canyon-puebloans.html&gt;. Presilla, Maricel E. The new taste of chocolate : a cultural and natural history of cacao with recipes. Berkeley Calif: Ten Speed Press, 2009. Print. “Chocolate Pot | Edward Winslow | 33.120.221 | Work of Art | Heilbrunn Timeline of Art History | The Metropolitan Museum of Art.” The Met’s Heilbrunn Timeline of Art History. N.p., n.d. Web. 10 Mar. 2017. <http://www.metmuseum.org/toah/works-of-art/33.120.221/&gt;. Chocolate, the apparently simple food actually has a very rich and complex history. It is believed that it originated at the time of the first Mesoamerican civilizations and it played a very important role. That role has changed considerably over time, but today chocolate still plays an essential part of everyday life and it has become a tradition and ritual in many holidays. Even though some researchers haven’t been able to find the exact time period of the beginning of chocolate consumption, it is widely believed that it commenced during the Olmec civilization, almost 4 millennia ago. This was confirmed by archeologists from the University of Pennsylvania who in 2008 announced that they found “ceramic vessels with residue traces of theobromine” in the sites of El Manatí and San Lorenzo (Andrei 2015). However, there is very limited direct evidence on the use of cacao in Mesoamerica until the later Mayan and Aztec civilizations. The beliefs and uses of chocolate then were significantly different to those today. The sweet, warm, liquid beverage we enjoy today is not what it was like during that time since they didn’t have access to ingredients like sugar. The Mayans prepared the drink in liquid form “seasoned with chili peppers and cornmeal, transferring the mixture repeatedly between pots until the top was covered with a thick foam” and it was mostly consumed by their Kings, nobleman, and newly married couples (Andrei 2015). Moreover, the Mayans also used chocolate for ritualistic purposes and for medicinal use. The Mayans frequently combined blood and chocolate as offerings for their Gods and had different chocolate recipes for different rituals. It is even believed that they had a Cacao God or Goddess. Furthermore, chocolate was credited with “curative properties – everything from reducing fever to helping clean the teeth was attributed to the cacao wonder” (Andrei 2015). Overall, chocolate played a very important role in the Mayan civilization and chocolate is portrayed in many Mayan texts, vessels, murals, and other types of art. Chocolate might have played an even bigger role in the Aztec civilization because they did not only love chocolate, but they also had challenges acquiring it. Even though, the Aztecs believed that chocolate drinks were intoxicating and, as a result, did not allow women and children to consume it, their “nobility and male soldiers loved chocolate… It was served as a beverage only to adult males, specifically priests, government officials, military officers, distinguished warriors, and sometimes to the bravest enemy captives before sacrifice” (Grivetti 2005). The difficulty in obtaining chocolate – because it did not grow around the highlands of Tenochtitlan – also added value and importance to cacao. It was so precious that the Aztecs even used it as currency and imposed taxes in the form of cacao to people they conquered. According to Sophie and Michael Coe, “a single cacao bean would buy one large tomato; three beans, a newly picked avocado; 30 beans, a rabbit; and 200 beans, a turkey” (Coe 1996). Additionally, like the Mayans, chocolate for the Aztecs had a religious importance. “In Aztec ritual, cacao was a metaphor for the heart torn out in sacrifice – the seeds inside the pod were thought to be like blood spilling out of the human body. Chocolate drinks were sometimes dyed blood-red with annatto to underline the point” (Henry 2009). With regards to the preparation process it was mostly similar to the Mayans, however the Aztecs had their chocolate drink cold, whereas the Mayans warm. There are a lot of similarities in the importance of cacao culturally and religiously in the Aztec and Mayan civilizations. Today, chocolate is not seen as divine and important as it was back then, however, there is an argument to make that culture and tradit ion are important factors in the consumption of chocolate nowadays. Technology has played a role in accelerating the production of chocolate and significant labor is not required anymore. As a result, chocolate has globalized and it is accessible in every part of the world. This has led to significant changes in the customs and beliefs throughout time. The way chocolate is consumed today is very different than it was hundreds of years ago. The production of this product has increased dramatically and now it is accessible and consumed in many different shape and forms. Chocolate is eatable in bars, liquid, and could achieve almost any form. There are chocolate factories that have statues of many different things and objects that are made of chocolate. The most common uses for chocolate today are as dessert, reward, or gift. Eating sweet chocolate tends to put people in a better mood and provides them with energy. The taste gives m any people incredible satisfaction which is why they use it for a wide variety of desserts. Once they accomplish their set goal they will reward themselves with a chocolate treat. Chocolate has also become one of the best and most common gifts people give during special occasions and holidays. For example, for many people, Valentine’s day wouldn’t feel right without giving chocolate as a gift to my significant other. Chocolate has transitioned from divine in ancient civilizations to part of our everyday life today. However, there is still a ritual factor involved when consuming chocolate currently. No longer does it involve sacrifices or blood, but rather satisfaction, pleasure, and reward. People have many different uses for cacao, however the presence of a ritual is still involved at times. In my case this is during Valentine’s and when I visit my grandmother who makes a delicious homemade hot chocolate. For others it is during their birthday, Halloween, or Christmas, but the tradition continues. Andrei, Mihai. “Chocolate History: The Early Days, Mesoamericans, Culture and Rituals. “ZME Science. N.p., 13 Aug. (2015). Champurrado (Mexican Hot Chocolate). Dir. Tastemade. Youtube, 10 Dec. 2012. Web. <https://www.youtube.com/watch?v=oKCVI9fbdzA&gt;. Coe, Sophie D., and Michael D. Coe. “The True History of Chocolate.” (1996). Grivetti, Louis E. “From aphrodisiac to health food: A cultural history of chocolate.” (2005). Henry, Diana. “Aztecs and Cacao: The Bittersweet past of Chocolate.” The Telegraph. Telegraph Media Group, 15 Sept. (2009). Hunt, Patrick. Maya and Aztec Chocolate History and Antecedents. Digital image. Food History. Electrum Magazine, 01 Apr. 2013. Web. McDonald, James. “Why Do We Love To Eat Chocolate?” Food Guide. Street Directory, n.d. Web. Oliver, Thomas. A Chocolate Love Affair. Digital image. Eye on Spain. N.p., n.d. Web. O’Neil, Megan E. Chocolate, Food of the Gods, in Maya Art. Digital image. LACMA. LACMA, 27 Oct. 2016. Web. The Globalization of Chocolate Meriem Abid. Digital image. Infograph. Venngage, n.d. Web. Chocolate has elicited interest as a possible medicine across time for early Mesoamericans to Renaissance Europeans to modern Americans. Renaissance Europeans, desperate for medical solutions, attempted to fit chocolate into their rudimentary medical theory and touted it as a cure for a wide array of maladies. A medicinal framing of chocolate facilitated its journey to Europe where it expanded its influence into culture. Despite continued debate, chocolate’s medical potential opened a gateway that allowed chocolate to enter and become largely accepted in European society. This interest and debate continues with a modern resurgence of interest in chocolate as medicine. Today researchers investigate the health benefits of chocolate while health bloggers proliferate their own sometimes exaggerated perspectives. Chocolate held spiritual and monetary value for the Mayan and Aztec peoples of Mesoamerica. However, it also fit into their medical theory. Mesoamericans believed disease and illness was born from imbalances of hot and cold. The Florentine Codex of 1590, created by a Spanish priest, noted that Mesoamericans drank chocolate to ease stomach pain and cure infections. It also played a role in treating diarrhea, fevers, and coughs (Dillinger, et al). Europeans had a framework for understanding illness that traces back to the ancient Greek “Humoral Theory of Disease and Nutrition.” This theory holds that the body contains four humors– wet, dry, hot and cold. Like the Mesoamericans, they believed ill health stemmed from imbalance. In 130 AD Galen advanced the idea that disease could be treated by applying the opposite humor (a hot disease can be cured with a cold medicine, and so on). Europeans like Franciso Hernandez worked to fit chocolate into the medical theory of humors. Hernandez decided that chocolate should be classified as a “cold” drug (Coe & Coe, 122). The medical potential of chocolate was appealing to Europeans, who were routinely affected by infections, diseases, and plagues for which they had no effective cure. In addition, a medical use provided a convenient rationale for drinking chocolate, for Christian Europeans were suspicious of substances like chocolate, coffee and tea that might “upset moral behaviors” because of their “amorous properties and exciting effects” (Lippi). As a result, chocolate entered Europe cloaked as medicine that fit into the humoral theory of disease. However, like many other “drugs” such as coffee and tea, its role transformed into one of recreation. (Coe & Coe, 126). Doctors in each country debated its virtues and drawbacks while chocolate continued to develop a cultural role. Chocolate began its European journeys in the Spanish court in the 17th century. Marie de Villars, wife of the French ambassador to Spain, provides evidence that the elite believed in the health benefits of chocolate. De Villars writes “I observe my chocolate diet, to which I believe I owe my health…” (Coe & Coe). Chocolate transformed into a drink that conveyed elite status and became common in the Spanish court. Chocolate likely entered Italy, France and England as medicine as well. Bonaventure d’ Argonne wrote that “…the Cardinal of Lyon was the first in France to use this drug… he uses it to moderate the vapors of his spleen” (Coe & Coe, 152). Chocolate became popular in French court while physicians continued to debate its medical properties. When chocolate arrived in England, a newspaper advertisement from 1659 claims that chocolate “cures and preserves the body of many diseases” (165). In England, chocolate expanded its cultural role beyond just the elite, as it was served to commoners in coffee houses. However, the popular chocolate drink, which was mixed with sugar, arose medical suspicions. Martin Lister wrote that after taking chocolate, “your Stomach is faint, craving and feels hollow and empty… it wears it [the gut] out.” Dr. Henry Stubbes felt that chocolate on its own was healthy, but the added sugar was not (170). The popular food blogger known as “The Food Babe” criticizes our modern chocolate for additives beyond just sugar. She shares concerns about the negative health impacts of corn syrup, trans fats, and artificial flavors and preservatives. With negative attention like this in the media, it is easy to see why chocolate is perceived as unhealthy. However, modern medical researchers have renewed interest in the health benefits of chocolate as a stand alone ingredient, unadulterated by sugar and additives. In 2011, researchers studied the heart health of 4970 participants aged 25-93 and recorded their chocolate intake. They found that participants who consumed chocolate had a decreased risk for coronary heart disease (Djousse, et al). Another 2011 study assessed other studies of chocolate and heart health. These researchers found that five out of seven studies showed chocolate to correlate with heart health. The most significant finding was that chocolate was associated with a 37% reduction in heart disease (Buitrago-Lopez, et al). Medical research has revealed benefits beyond heart health as well. In 2013, a study revealed that polyphenols in chocolate correlate to positive mood. Participants who consumed chocolate reported an increase in calmness and contentment (Pase, et al). Health bloggers and news sites often pick up on these research studies and present them for the average reader. However, their articles often simplify or exaggerate the health benefits of chocolate, and fail to clearly explain the meaning of recent research. These articles sound encouraging, but Harvard Women’s Health Watch reminds us to remain skeptical because “while some observational studies have linked chocolate consumption to reductions in heart disease and dementia, they don’t establish a cause-and-effect relationship” (Is Chocolate Really a Health Food?). Further research is needed to confirm that the antioxidants in chocolate are truly protecting us against disease. Chocolate originally crossed the ocean to Europe as medicine, allowing it to overcome Christian suspicions around the moral permissibility of such an “exciting” drink. In Spain, Italy and France chocolate became a recreational drink for the elite and in England it expanded its reach to the common people. Chocolate’s recreational role eclipsed its medicinal and chocolate became commonplace in Western culture as a dessert; however, the debate over chocolate’s medical value never disappeared. Today we are witnessing a rebirth of curiosity in chocolate as medicine, as modern researchers aim to use scientific method to confirm what we all hope– that chocolate is more than just a delicious treat, but a healthy one too! Buitrago-Lopez, et al. “Chocolate Consumption and Cardiometabolic Disorders: Systematic Review and Meta-analysis.” BMJ (Clinical Research Ed.). U.S. National Library of Medicine, 2011. Web. 04 Mar. 2017. Dillinger, et al. “Food of the Gods: Cure for Humanity? A Cultural History of the Medicinal and Ritual Use of Chocolate.” American Society for Nutritional Sciences. 2000. Web. Djousse, et al. “Chocolate Consumption Is Inversely Associated with Prevalent Coronary Heart Disease: The National Heart, Lung, and Blood Institute Family Heart Study.” Clinical Nutrition. U.S. National Library of Medicine, 2011. Web. 04 Mar. 2017. “Is Chocolate Really a Health Food?” Harvard Health Publications. Harvard Medical School, Sept. 2015. Web. 04 Mar. 2017. Lippi, Donatella. Nutrients. May 2013. Web. Pase, et al. “Cocoa Polyphenols Enhance Positive Mood States but Not Cognitive Performance: A Randomized, Placebo-controlled Trial.” Journal of Psychopharmacology. U.S. National Library of Medicine, 2013. Web. 04 Mar. 2017. Sophie D. Coe & Michael D. Coe. The True History of Chocolate. Thames & Hudson, 1996.